FREE APPRAISAL. To buy, auction, sell or consign your Joseph Brant autograph that is for sale, please email Nate@NateDSanders.com or call Nate D. Sanders Auctions (http://www.NateDSanders.com) at (310) 440-2982. Joseph Brant, Native American name Thayendanegea, belonged to the Mohawk Native American tribe and lived where present day New York is. Brant is best-known for being a military leader who aligned with loyalists and England’s troops during the American Revolution. He was given the nickname “Monster Brant” during the Revolutionary War based on stories and horrors from the battles. Historians later uncovered that Brant had more compassion and humanity than his wartime reputation led others to believe. A Joseph Brant autograph is very valuable. To put things into perspective, a circa 1775 Joseph Brant autograph letter recently sold for roughly $35,000. Consign your Joseph Brant autograph that is for sale. Contact nate@natedsanders.com to sell your Joseph Brant autograph. Historically important George Washington autograph letter signed “G. Washington” from “Headquarters”, dated 1 December 1777, as Washington was deciding where to encamp his troops for the winter. 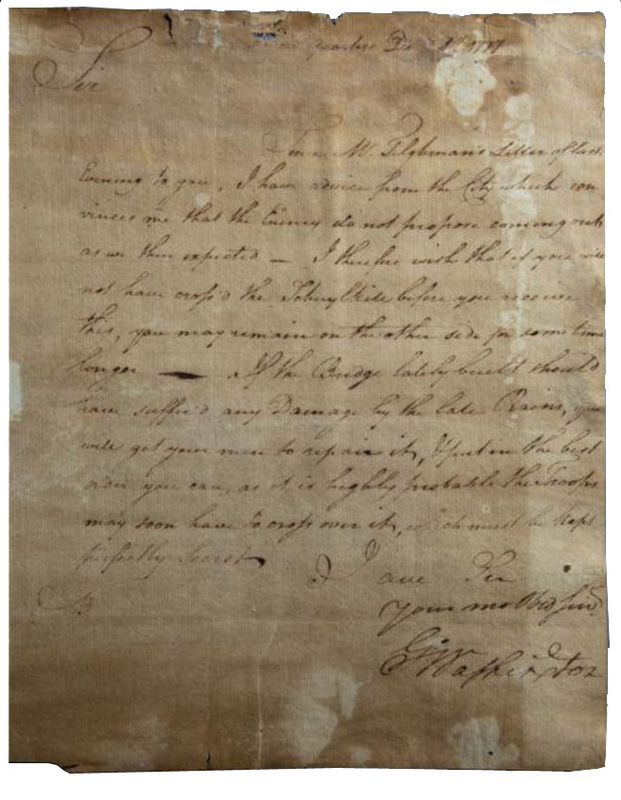 As this letter demonstrates, he had already secured the location of Valley Forge, a decision which proved to be a major success in the War, as the area was highly defensible and strategically located from British forces. Washington would lead his troops to Valley Forge less than three weeks later, on 19 December 1777, where they would regroup for the winter and learn military training from Baron von Steuben. Letter, addressed to Brigadier General Potter, reads: “Sir, Since Mr. Tilghman’s letter of last Evening to you, I have advice from the City which convinces me that the Enemy do not propose coming out as we then expected. I therefore wish that if you will not have crossed the Schuylkill before you receive this, you may remain on the other side for sometime longer. If the Bridge lately built should have suffer’d any Damage by the late Rains, you will get your men to repair it, in the best order you can, as it is highly probable that Troops may soon have to cross over it, which must be kept perfectly Secret. I am Sir Your most Obe’d Serv / G. Washington”. Letter includes an original Crest Watermark. In good condition, with uneven edges, toning and dampstaining throughout, as one would expect of a letter being carried on field in the winter of 1777. Sold for $30,658. George Washington Autograph. Click to enlarge. 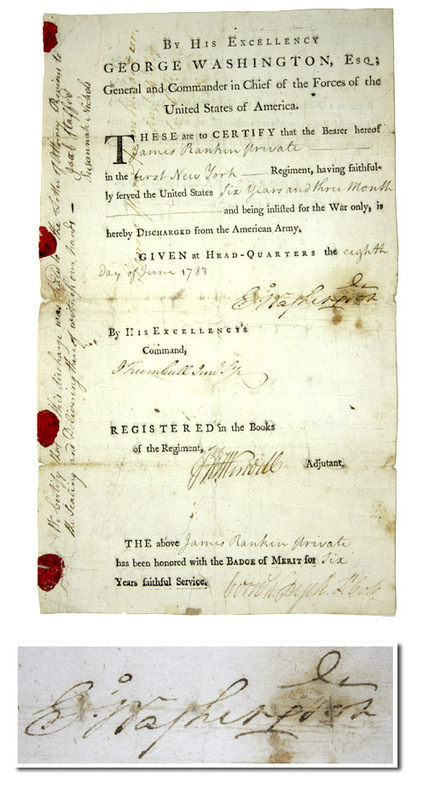 Rare Revolutionary War dated document signed by its Commanding General George Washington. From New Windsor dated 8 June 1783, signed “Geo Washington”, the partly printed document discharges James Ranking, a private in the 1st New York Regiment. Countersigned by John Trumbell as Colonel and Washington’s aide, and Joab Stafford, Colonel of the Silver Greys, a battery of Berkshire volunteers. Washington’s signature, though large and prominent, is slightly obscured by a horizontal fold and marred by evidence of verso tape, slight missing paper between “G” and “e” of first name and the “o” of last name. Single page folio document bears slight toning and folds throughout, though generally very good. Overall a very attractive document with remnants of red wax seal still intact and “By His Excellency / George Washington” clearly printed atop document. Sold for $10,745. George Washington Autograph – Revolutionary War Discharge Document. 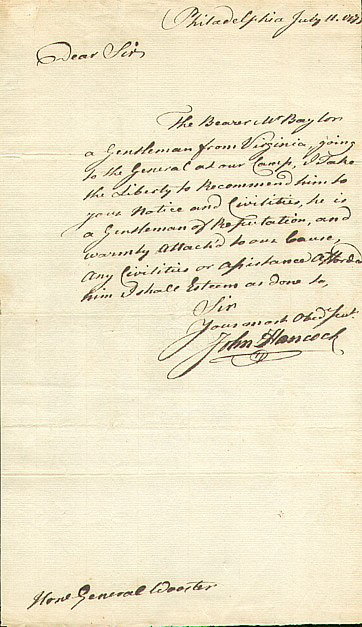 John Hancock autograph letter signed “John Hancock”, with his distinctive flourish, as President of the Continental Congress, to Major General David Wooster, Philadelphia, 11 July 177. Single page, quarto, in fine condition. Written by Hancock while President of the Continental Congress at the outset of the Revolutionary War, recommending George Baylor for a military command. Hancock writes: “The Bearer Mr. Baylor…I take the Liberty to Recommend him to your Notice and Civilities, he is a Gentleman of Reputation…Any Civilities or Assistance Afforded him I shall Esteem.” General Wooster, a commander of six Connecticut regiments early in the war, took part in campaigns in Canada and New York and was mortally wounded during the Danbury Raid in 1777. Baylor, Commander of the 3rd Continental Dragoons, was selected as an aide de camp by George Washington and was commissioned as a Lieutenant Colonel. He received the thanks of the Continental Congress after presenting the delegates with a captured British flag obtained at the Battle of Trenton. Bold John Hancock autograph. Sold for $9,768. Please let us know if you have a Joseph Brant autograph for sale. Top dollar obtained for your Joseph Brant autograph. Joseph Brant autograph for sale.